Today was our last full day here so we set ourselves a challenge to get up early and watch the alms giving ceremony followed by sunrise on Mount Phousi. Well, we managed half of that plan. 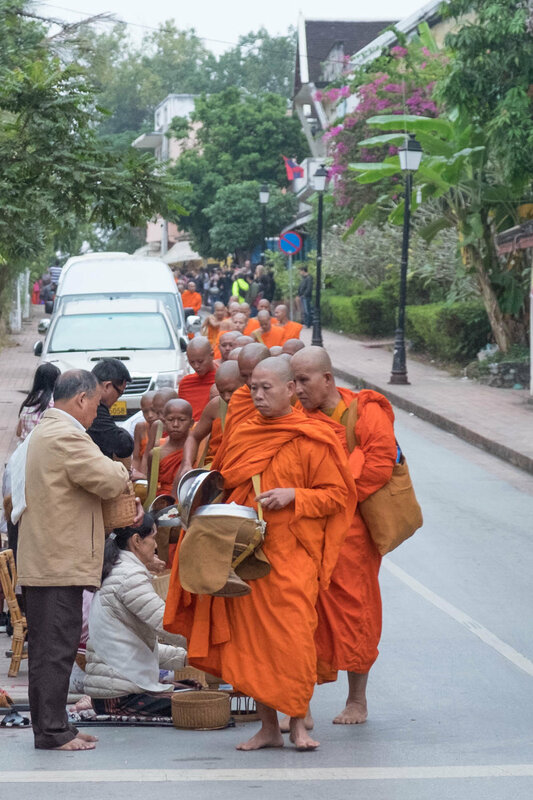 The tradition of alms giving is yonks old but every day in Luang Prabang about 200 Buddhist monks depart from their temples to gather their daily meals from locals on the streets. It was eerily quiet to begin and catching a glimpse (from the other side of the street) of the ceremony and interaction between the monks and locals was pretty special. Thankfully as we make our way back down to the streets below it had brightened which allowed me to snap a couple of photos from the almsgiving as the monks made their way through the town. The great thing about getting up early and doing stuff is that by 8am you feel you've already accomplished loads. And can have a nap. The rest of our day was pretty lazy, wandering temples and museums. I'm blown away by the fabrics here — the colours, the patterns! I discovered there's a dyeing and tapestry full day workshop which I would've loved to have done but alas we leave in the morn. Gav also has taken a liking to the idea of a carving workshop, so perhaps we'll find more opportunities on our travels to learn the crafts. In what seems to have been our most cultural day yet, we end it with a visit to a traditional folklore show to learn about the town's history through storytelling. It was brilliant! Claire likes animals, except when they crawl down her back like our little ghecko friend did at the market. It was all the funnier because the woman on the stall we were loitering at was napping, and Claire's screech scared the **** out of her. BUT... we were potential customers so she had to be nice whilst also wanting to kill us! Watching hundreds of monks gracefully glide through the streets at dawn is something else. Massive respect to those monks and the local people who dedicate themselves to this tradition, I was truly humbled. Watching hundreds of (mostly) Chinese tourists pour out tour buses to loudly and disrespectfully overpower the beauty and tradition of a sacred tradition left a sour taste. It also epitomises the delicate social and cultural balance I feel both of my being in this part of the world and the contribution I as a tourist make to it. Deep man.